The Chinese Lunar New Year Eve, the most anticipated time for family reunions, is two days away and is the perfect time for Chinese people to return home. Regardless of financial or professional standing, family members are always there for the reunion. Thousands of millions of Chinese people have left the places they work in to their hometowns in the past week. But for others, returning home is an "impossible dream." They continue to work, providing the necessities of life and protecting others to keep the giant social machine running smoothly while most people take a break. While these people come from different places, speak different dialects and have different jobs and dreams, they are the most "adorable" people in our hearts. In this issue, Global Times reporters talked to people who stay at the frontline of their work during the Spring Festival holidays. "What I most regret is that I missed the last Spring Festival reunion dinner with my late grandmother." Song Ci (middle) is a doctor at the Beijing Emergency Center's Xicheng branch, and has spent nine Spring Festival holidays in an ambulance. He has never had a Lunar New Year Eve gathering dinner since he started this job nine years ago. Song said what he is doing shouldn't be elevated to "nobility" and he is only doing what his job requires him to do. Song receives triple pay and dumplings from leaders during the holiday. Song has two children. He said he is concerned that, when his children grow up, they will ask him why he hasn't been going home for Spring Festival. 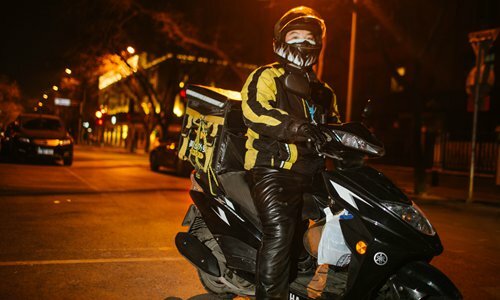 "My father told me to be careful while riding my electric bicycle to deliver food." 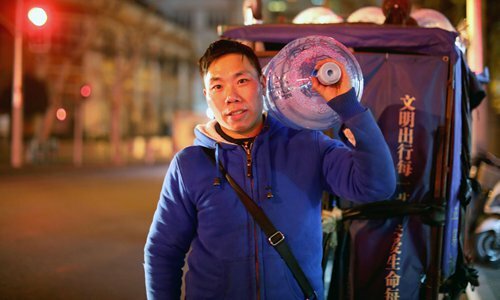 Zhang Chunlin, who hails from Handan, North China's Hebei Province, is a food deliveryman in Beijing. Zhang, 30, will not return home for Spring Festival for the second consecutive year. He said he wants to make more money to improve his family's living standards. He estimated that his income could increase by 3,000 to 5,000 yuan ($445-$742) during the week-long holiday. Zhang will have the reunion dinner on the Lunar New Year Eve with friends and fellow townsmen. "I'm satisfied. I can take days off after the Spring Festival holidays." 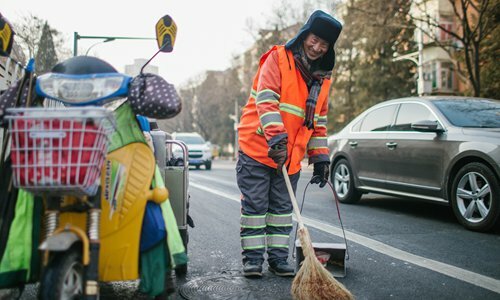 Sun Jianxin, 51, is a cleaner in Beijing's Shijingshan district. This is the first year he won't go home for the Chinese Lunar New Year even though his home is in Beijing's Miyun county, about 100 kilometers from Shijingshan district. Sun said compared with his colleagues from North China's Hebei Province, not returning home for Spring Festival isn't a big deal as his family isn't far away. He can get triple pay for working during the holiday. "I haven't returned home for Chinese Lunar New Year gatherings for the past 8 years." Niu Juan, 43, rides through big streets and small alleys in Shanghai on his electric tricycle. While the city's strong winds penetrate people's bones, Niu, a water deliveryman, doesn't wear many clothes to keep warm as he is always on the move. This year, Niu, who comes from Zunyi, Southwest China's Guizhou Province, said he won't return to his hometown for the upcoming Chinese Lunar New Year because his workload will increase during this time. Niu hasn't returned home for the traditional festival since he came to Shanghai eight years ago. He said he misses his children very much and is pleased with their good performance in school. Niu added he feels satisfied with the extra money he could make during the holiday.